Life Is What Happens: Irish Diamonds....maybe? Well I have started the second sweater from Knitting in the Old Way by Priscilla Gibson-Roberts. I decided on using 3 strands of Fiddlesticks Knitting lace weight Zephyr which gave me a gauge of 24 sts over 4". Just a bit finer than DK; but I wanted a lighter sweater. I also decided on the colour Basil over Royal - a really tough decision - only because I have green eyes. Not that I have anything in my current wardrobe that will go with this particular shade of green - but that has never stopped me before! 1. I used Priscilla's template for sweater measurements. I measured my chest allowed 2 -4" for ease - actually 2" because I wanted a slimmer fit than the cropped version - and called that 100%. All other measurements will be a percentage of this 100%. Technically then I should have cast on sts that were 90% of the total 100% for the bottom band, but I wanted a tunic style and I know I need the extra width at the hips, so I just cast on the number of sts that would give me the total chest measurement - still with me? 2. The diamond pattern is multiples of 12 plus 7. This may be centered on both the front and the back so it is not really necessary to have your cast on sts be an exact "fit" with the graph. 3. The bottom border is seed stitch in 2 sections joined together after about 2" have been worked to create a welt on either side as follows: purl together the last two stitches on either side from both the front and back sections, as you would do with a 3 needle bind off - except don't bind them off. Also remember to lap the front over the back on both sides before purling them together. 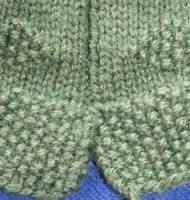 These two purled stitches form the basis of the false seam that travels up th e side of the garment and down the sleeve. 4. 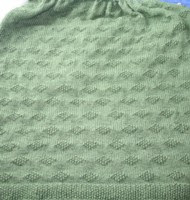 Knit 5 rows - remembering to purl the 2 false seam sts and then begin the diamond pattern.